Tarantula | Tarantula Luxembourg & Donato Rotunno at International Media Forum in Tbilisi! Tarantula Luxembourg & Donato Rotunno at International Media Forum in Tbilisi! 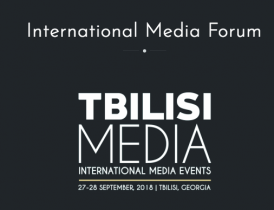 Donato Rotunno will be at the International Media Forum organized in Tbilisi, Georgia, on September 27th and 28th. He will present the CineWorld Fund from Luxembourg Film Fund and two case studies about films produced by Tarantula Luxembourg during a workshop.